Web browsing has become almost second nature to us. Each day, we plunge into tens of websites and unwittingly accept their long-winded privacy policies without bothering to peruse their stipulations. This is undoubtedly because those documents are shrouded in legalese too dense and cumbersome to read and digest. Yet, it is a well-known fact that many websites collect, store, and even use the private data that we inadvertently leave behind during our browsing sessions. Disturbingly, such practices are usually protected by the legal jargon contained in their privacy policies. So how do we ascertain the nature of data collected by a website? Is it possible to know how our data will be used by a website even before we start browsing that site? To provide answers to questions like these, researchers from EPFL, University of Wisconsin, and University of Michigan have developed a program called Polisis that can read, decipher, and segmentize privacy policies of websites in a matter of seconds. 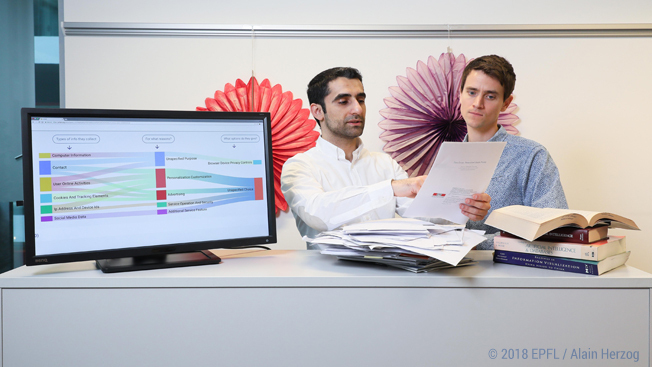 The lead researcher is Hamza Harkous, Postdoctoral Researcher at EPFL’s Distributed Information Systems Laboratory. Polisis is a free-to-use program available as a browser extension for Chrome and Firefox. It can also be accessed directly on the Polisis website.